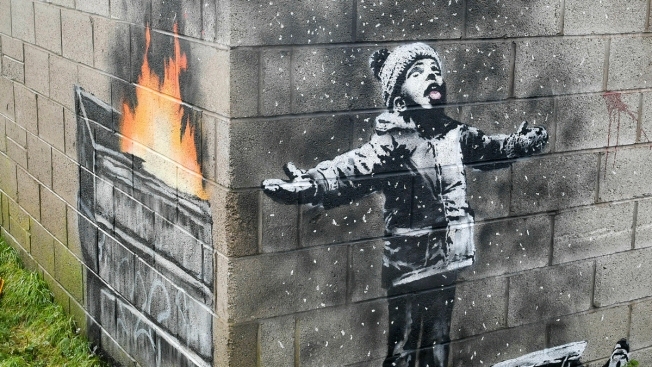 In this file photo dated Dec, 20, 2018, showing an artwork by Banksy on the side of a garage depicts a child dressed for snow playing in the falling ash and smoke from a skip fire, in Port Talbot, Wales. A British art dealer says he has bought a mural stenciled by street artist Banksy on a garage wall in Wales for more than 100,000 pounds ($129,000). A derelict, sea-front beach town in the UK has been given a facelift by British street artist Banksy. 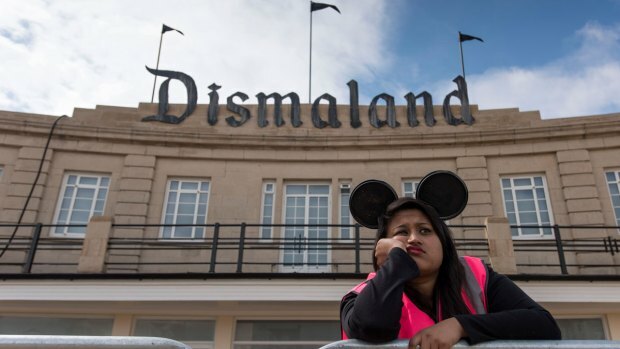 "Dismaland" features artwork by more than 50 artists, including a decrepit castle, graffiti and artwork of a dead princess in a coach crash. The park is billed as "UK's most disappointing new visitor attraction." He said "I want to make Port Talbot a go-to place rather than a go-from place. Within a short time I'm thinking of bringing five or six more Banksys to Port Talbot. Let's do an exhibition."